With its very long and delicate ears, which, during hibernation, are often folded under its forearms, the Brown Big-eared bat is clearly a member of the Plecotus genus. Its individuals have long, fluffy, brown grey fur , large eyes and relatively light coloured faces. P. auritus is a typical woodland species and can be observed in different types of forests. In southern Europe, it can also be observed in forests at higher altitudes. This species roosts in both trees and buildings during summer. In winter it can be found hibernating in tree cavities (if the winter is moderate) or in underground sites in small numbers. Typically, the Brown Big-eared bat emerges when it is completely dark. It captures its prey (e.g. moths, grasshoppers, spiders, earwigs, etc) either by using its wings or tail as a scoop or through foliage gleaning. P. auritus has a particularly sensitive auditive system, which allows it identify and catch quieter prey. This is a very sedentary species. 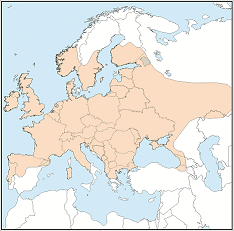 P. auritus occurs throughout the whole of Europe, however its distribution in the south is patchy. Stretches to the west of the Urals and north of the Caucasus. This species is threatened by the loss of broad-leaved forest in the Mediterranean range (Balkans, Portugal, Spain and Turkey).